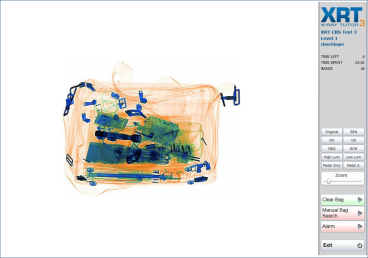 The X-Ray Tutor (XRT) was developed in close cooperation with universities, airport security experts, police and end-users to provide an easy-to-use and highly effective training software for X-ray image interpretation. X-Ray Tutor is the only training system on the market designed on the basis of scientific studies which takes into account the complex brain processes underlying the perception of visual information. The effectiveness of the system has been proven in several studies, showing substantial increases in detection performance. Due to the customizable adaptive level system, every user is presented images tailored to his/her individual knowledge and skills. This ensures that the user is optimally challenged by the presented images and maximizes his/her motivation to achieve the next level. XRT is available for different fields of operation, such as Cabin Baggage Screening, Cargo Screening, etc. Each library contains high-quality X-ray images of several hundred prohibited objects in various rotations and several thousand containers (e.g. bags, parcels – depending on the field of operation). 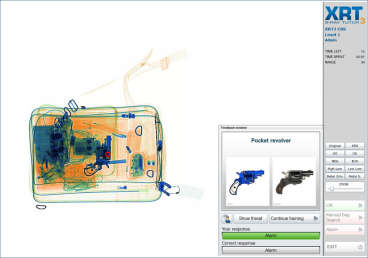 Thanks to the built-in merging algorithm, XRT is able to automatically generate unique bag-to-threat item combinations on the fly which reduces the possibility that a particular bag/threat item combination will be repeated in the training. The combinations are adapted to the individual level of the user. Up to three threat items per bag can be configured. 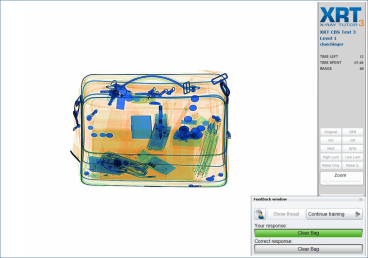 We have added a feature to train the appropriate behavior in case the security officer identifies a prohibited item in the bag. In addition to marking the object, the security officer has to decide which action to take depending on the threat item. The specific actions can be defined by the customer to meet the requirements of national regulations and/or internal procedures. The management by objectives allows the administrator to set training goals. 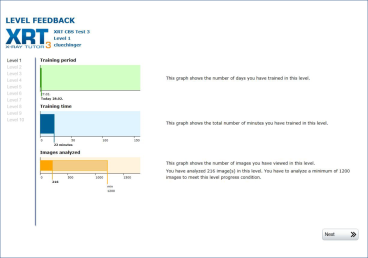 This function enables to keep track of the users’ training progress and provides a reference and motivational tool to ensure that the training requirements are met. 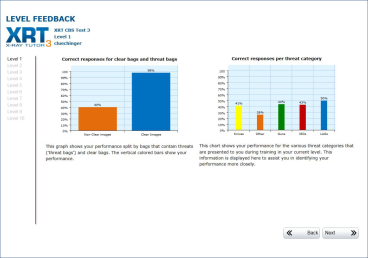 With our new feedback options, security officers can check the progress of their training, based on training time, number of bags and correct responses. With this feature users can easily see what the status of their training is and how far they are away from the next training level. The extensive administration functions help you to easily monitor and manage users and their profiles. 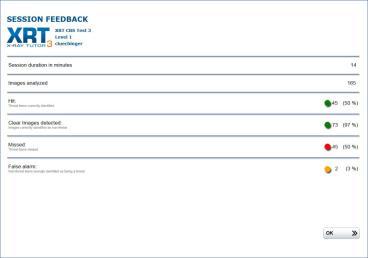 The detailed reporting functions provide you with overviews of each user’s training behavior and results. The software is built using the Microsoft Silverlight Framework and can be used with nearly every computer with Internet Explorer (see system requirements). It can be hosted on one of our encrypted servers. This makes the training very flexible and location-independent, while saving on additional IT infrastructure. In the Prison Screening area various container types are included (bags, letters, parcels, shoes) and a broad variety of guns, knives, IEDs as well as items which are prohibited in prison environments (e.g. cell phones, USB sticks, drugs). Additionally we provide multiple training libraries for specific organizations and critical infra-structures. This library is fully compliant with the EU regulation 2015/1998. There is also an extended version of XRT HBS available which contains dangerous goods. There is also an extended version of XRT CBS available which contains LAGs (liquids, gels and aerosols). 1. What is the difference between the Hosted and Local Solution? By using the Hosted Solution, users can access the training modules via web browser. Therefore expensive infrastructure on-site is unnecessary. By using the Local Solution, the customer must provide hardware as specified in the System Requirements. 2. What is the difference between the single license and the concurrent license? The single license is an annual fee per user. This license is only available for the hosted solution. One concurrent license allows you to create an unlimited amount of users, but only one user is allowed to train at a time. Concurrent licenses are available for the Hosted and Local solution. 3. In which languages is XRT3 available? The administration menu is available in English, German and French. The training courses and image libraries are available in English, German, French, Italian, Dutch, Polish, Swedish, Bulgarian and Arabic. For more information on other languages, please contact your sales partner or CASRA. 4. Can the customer record and use their own images for the XRT3 training? Customers can record and use their own images for the XRT3 training. Please contact your sales partner or CASRA for more information. 5. Can XRT3 also be bought as a one-time action or is it necessary to purchase a new license every year? The local solution licenses can also be one-time purchased. It is recommended to get yearly licenses to benefit from free software and image library updates. However, there is also the possibility to purchase each software and image library update individually. 6. Is XRT3 available in different editions? XRT3 used to be available as basic and advanced edition. As of now, only the advanced edition is available. 7. Where can the public IP-Address be found? The public IP-Address can be found out by opening the following link on one of the workstations where the webhosting will be used. 8. Is XRT3 already in use? If yes, where? 9. When is the support service available? CASRA provides support service during office hours on weekdays between 9:00 am to 12:00 am and 2:00 pm to 5:00 pm. 10. Does the software only work after installing Microsoft Silverlight? The customer must install at least the Microsoft Silverlight Version 5 prior to using the software. 11. On which internet browser does the software run? 12. What does the category “Others” within X-Ray Tutor 3 consist of? The category “Others” consists of all threat items which cannot be allocated to the other categories (guns, knives or IEDs). Some examples are: baton, stun gun, fireworks, etc. 13. Is it possible to receive detailed information regarding the content of the image libraries (number of threat items, images, etc. )?